Earlier this week, I reviewed this Morphy Richards soup maker after trialling it for a few days. I did say that I would be putting one up for a giveaway and here it is. All you have to do to be in with a chance of winning is to complete the steps in the rafflecopter widget and obviously get in touch within 7 days if you are picked as the winner through random generator. It’s currently on sale at the discounted price of £44.99 by using the code GH2255 on the Morphy Richards website. Good luck to you all, this is indeed a time saver in the kitchen and one that is now my new best friend. If the widget sticks you will find the direct link here. Morphy Richards reserves the right to amend, add or withdraw this giveaway at any time. The prize will be for one Morphy Richards Soup Maker. Slimming World ‘Speed Soup’ – delicious. I just love soups, but I guess my favourite would be homemade potato and leek. The ultimate comfort food – chicken. Good for the tummy and the soul! Just purchased this soup maker and after 3 sessions it failed! It burns, even if you start off with water! That’s a shame. Nothing has burned with me so far in using it. I like creamy tomato soup best. Spicy sweet potato and coconut. I love cawl, it’s welsh broth. Love it. Homemade pea and ham soup. I love carrot soup – cooked with a bit of potato for thickness. Yum yum. I love a classic veggie soup! Simple and yummy! My favourite by far is my own recipe sweet potato and coconut. Its got lots of fresh garlic, ginger, chilli and coriander as well as a hint of garam masala. Its so lovely! 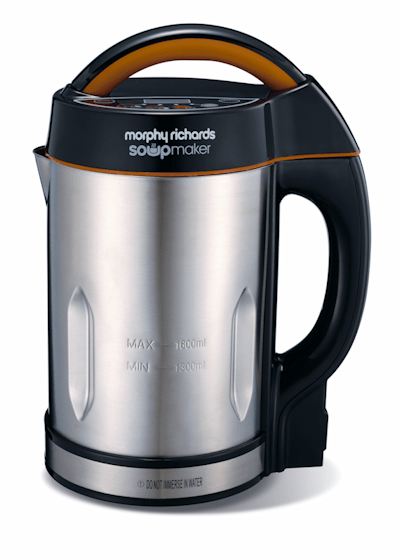 I love roasted red pepper soup and I’ve love to win this Morphy Richards 1.6 Litre Soup Maker. It looks wonderful. How awesome is this! I’m not usually a fan of kitchen gadgets but this looks amazingly helpful! Turkey and whatever vegetables are to hand. My favourite would be leek and potato – preferably with some croutons! My newly gluten free husband would love this! He misses soup…. I love Heinz tomato soup or homemade lentil soup! its not as bad as it sounds – bacon, potato and cheese soup.